Samsung pioneered the large-screen smartphone with the original Galaxy Note. The idea of phone and tablet hybrid — known as a phablet — was far better executed than the device itself. Today the company launched the Note5, and it feels every bit a phablet five years in the making. A steel chassis was introduced to the Note range last year. Samsung hadn’t made many smartphones using premium materials, and its use of aluminium on the Note 4 was a successful test run in the lead up to the Galaxy S6. The chassis of the Note5 is another step forward. The styling is borrowed from the S6 Edge, only it’s the back that wears curving glass. The resulting 5.7-inch smartphone sits in the palm comfortably. If the move looks familiar, it’s because Xiaomi pulled off a similar trick with its Mi Note. Premium materials account for the front and the back of the Note5. Earlier generations wore faux leather backs. They aged tastelessly over time. Coating the back of the 2015 model is Corning’s Gorilla Glass 4. Multiple nano-coatings have been applied to create the same shimmering colours as those found on the Galaxy S6. The smartphone alternates between shades of bright blue and dark black based on the way the light falls. The fifth generation Note packs hardware that is more powerful in a body that is smaller. Bordering the 5.7-inch, 1440p display are incredibly narrow bezels. It is less wide and slimmer than its predecessor, and when you’re wielding around such a large smartphone, cutting down the fat matters. Two parts work together to create the Note experience. The first has to do with its large, high resolution screen. The second pertains to its S-Pen stylus, which makes it possible to use the screen in different ways. A small change has been made to this generation’s S-Pen. Fingernails no longer need to pry the stylus out. It now pops out with a soft press — only partially — to make sure an accidental press doesn’t result in a lost stylus. Samsung drastically changed its rendition of Android over the last year. TouchWiz continues to mask an Android 5.1 operating system, only everything superfluous has been gutted. 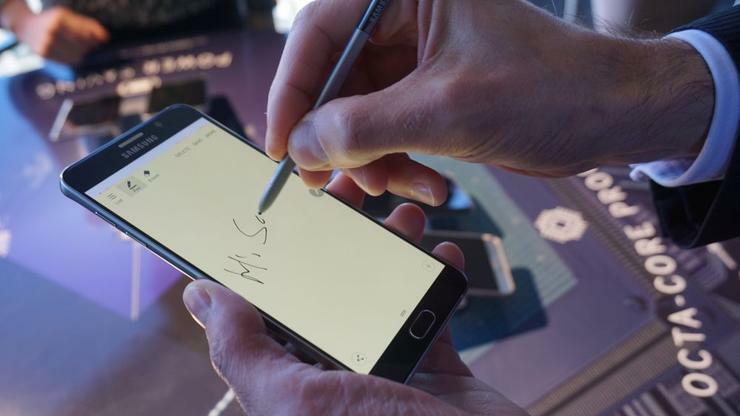 More Samsung apps are preinstalled on the Note5 to support the S-Pen stylus. Another noticeable change concerns the finger scanner. The old version necessitated a finger swipe and that the finger swipe happen vertically. It was a clunky solution. The rendition inherited by the Note5 is far more refined. It’ll work with a press and it’ll work at any angle. Parts of this phablet will anger fans of past Samsung smartphones. The 3000 milliamp-hour battery, for instance, is non-removable, and there’s no slot for expandable storage. People who buy the Note will have to make do with either 32- or 64-gigabytes of internal storage, and for a few heavy multimedia users, that may not be enough. The remaining specs read well. It has a 5MP front- and a 16MP rear-camera. Both cameras have an aperture of f/1.9, while the primary camera benefits from optical image stablisation. Internal hardware is similarly impressive. There’s the same Samsung-built Exynos 7420 processor found in the S6. It couples two quad-core CPUs; one clocked at 2.1GHz and another running at 1.5GHz, and its performance in the Galaxy S6 inspires confidence. Working with the processor is a Mali-T760 GPU and a whopping 4GB of RAM. There are Ultrabook computers that sell with less RAM. It’s too early to tell if the Note5 is a good smartphone; that endeavour warrants a full review. But as far as first impressions go, the Note5's is as good as it gets.